Holosun has been around for a while now. Some of their products are innovative in the red dot market. Lets take the HS503C for example. It starts as a red dot, adds in a circle dot option, and then adds in solar power to increase battery life. I contacted Holosun to get one in for review, and they graciously complied. I was intrigued by the 503C's solar power. I will do my best to explain it. The solar panel sits on top of the optic and does not charge the battery. Don't be disappointed though, it runs the circle dot very well. In fact it will actually run the circle dot in daylight, without the battery! When talking with Holosun, they mentioned that the 403C even works better with solar power, and probably would run without a battery in pretty low light, but it is a red dot only. However, when running the 503C on the solar setting, only the circle dot works. The option of having a red dot or circle dot reticle only works on battery power, which was kind of disappointing. When using the battery power, one can switch between the dot or circle dot by holding down the "-" button. To switch between solar and battery, and vis-versa, hold down the "+" button. The HS503C comes with everything you need. When you first open the box, you notice that the red dot is already attached to a riser mount. This gives you a lower 1/3 co-witness with an AR rifle's iron sights. You can remove the riser and put on the supplied low mount if you are mounting it to something that doesn't need the extra height. Also in the box are tools to mount and adjust the sight, a screwdriver to remove and install the battery, a cleaning cloth, and a set of rubber caps. I mounted this one on an AR. One of the big downfalls of this sight are the teeny screws that hold the battery in, make sure you use the proper phillips head screwdriver so as to not strip them out. The HS503C has an industry standard T1 mounting size, so any aftermarket Aimpoint T1 mounts should work, but I would try it beforehand, just in case. Now on to some specs. The HS503C has a 2moa dot or a 65moa circle with a central 2moa dot. The adjustments are 1/2 moa with the caps serving as the adjustment screwdriver. Also inside the cap are the markings for up/down and left/right. On the right side is the battery tray, it is held in by 2 screws. Also on the right side is the brightness and on/off buttons. To turn the sight on, push the "+" button, to turn it off, hold down both buttons. In the battery only mode, you can adjust brightness by pushing the "+" or "-" buttons. In solar mode the dot will auto adjust for brightness. There are 9 daylight brightness settings and 2 night vision ones. 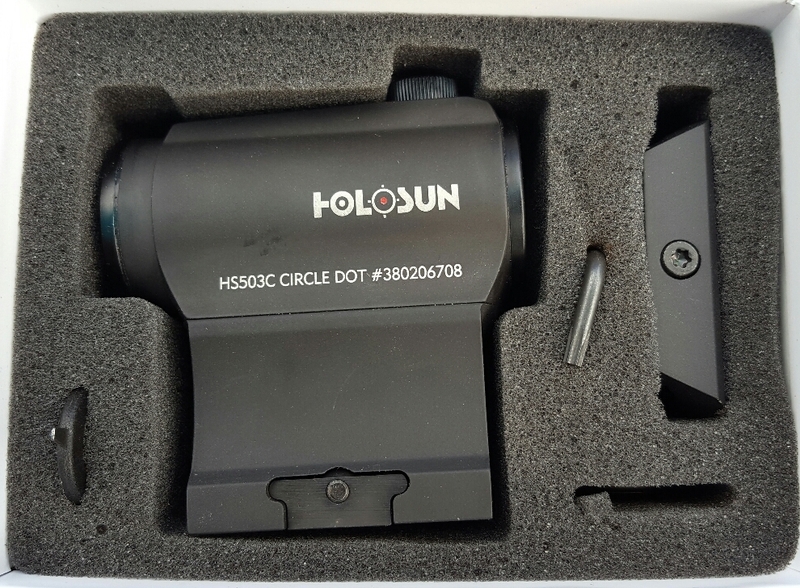 Holosun states 50,000 hours of runtime with the dot at the 6 setting and 20,000 with the circle dot, so on par with other brands. I have been using the HS503C for some time now. The sight is very clear. The 2moa dot allows for precise engagements. Having the 65moa circle dot is a nice option, and it really shines when shooting up close. But my favorite part is probably the self adjusting solar setting. Even in direct bright sun light, the circle dot was easily visible on the solar setting, the same in low light. I haven't treated the Holosun very nice either, it has been thrown in the back of a pickup a few times, dropped on the ground, and it has held zero. People sometimes ask if I would recommend certain products. The Holosun is on that list. It has done everything I could ask it to do. If your looking for a good mid priced red dot, check them out. Let's start with the positives, PRICE is awesome for what you get!!! The glass is really clear and the dot / circle dot are just about perfect. Easy to sight in and it works just as advertised. Best buy for the money hands down. Now there are a couple of fustrating things about it. The battery tray screws trust me these things are tiny and a Philips head to boot put down a white towel when the come loose and hit the ground they disappear. Ask me how I know. A torx bit or hex head would make installation much better. The dot adjustment buttons are smallish and are much easier to use using your trigger hand if you are right handed. This doesn't sound too bad until you try it. I also feel that I'd you like to shoot wearing gloves the size of the pads are just too small. Now that being said I still am extremely happy with this purchase and would and will buy it again. HS503C... Buy it you wont regret it! After looking around and doing research for an optic for my new lightweight AR build I decided to go with the holosun and man I'm glad I did. The HS503C has a Crisp circle reticle and dot amazingly cleaner than the EO tech. I love the option of being able to switch between the 65 MOA circle with a 2 MOA dot and the single red dot. It's easy to zero and function, the solar option is a great feature but the battery life is even better. Bang for buck you can't beat it!